Outdoors, yes. It will kill most species of beetles and is perfectly ok to apply to lawns, trees and shrubs. Indoors, no. This product is not labeled or designed to be used indoors period. Do not affix to a water hose and apply indoors. If you need specific indoor carpet beetle control products let me know. I have black carpet beetles in my 5th wheel. I bought triazicide lawn insecticide 32oz. It was bundled with specticide wasp and hornet killer 20oz for only 3 bucks! Can't I dilute it, put it in a small spray bottle and spray around the edges of the carpet inside? I can't afford the other insecticides. I have cats too. Please help. What can I do? I would not spray Triazicide indoors as it is not labeled for this use. I would recommend to spray it around the outside of the 5th wheel, and under it only. Black carpet beetles also will feed and live around plants, flowers, etc. Indoors remove them by vacuuming. If you need to treat the indoors, I would only recommend a product such as Ultracide that is labeled for indoor use and will not leave a stinky mess. 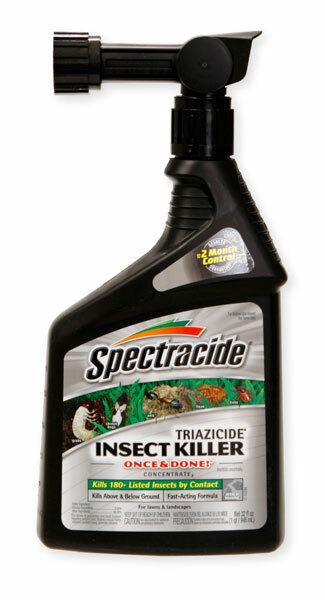 Triazicide will leave a stinky mess if not applied properly. Thank you so much. I will use Triazicide outside like you said and buy Ultracide for indoors. I'm so happy you answered before I did something really stupid and stinky! Thanks again.